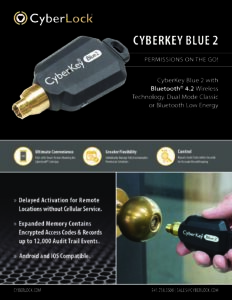 CyberLock was first to market with Bluetooth key technology 7 years ago. 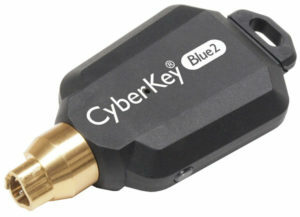 CyberKey Blue 2, our latest dual-mode Bluetooth key, extends battery life, requiring only one charge per week! Expanded memory records 12,000 key events or 250 lock downloads. Android, iOS, and Windows compatible. Check key status and update access permissions on the fly. Powerful new features with software enhancement module, like delayed activation for locations without cellular service and Variable Temporary Access (2 minutes – 72 hours) provide ultimate control. CyberKey smart keys are designed with highly durable fiberglass-reinforced casings and are programmed with access permissions for each key holder.